It seems every aspect of my life these days is preceded by “re-“. Rethink. Readjust. Redo. Sometimes even Refresh. There isn’t a piece of software or a pile of hardware that has refreshed more than I have in the last three years. I don’t want to talk about the economy, because it makes me Repeat everything that everyone already knows. So let’s look at this concept of “re-” from a gardening perspective. I went into the garden on a hot Saturday morning to assess, plan, and then act. I was pretty sure I’d spend my day tying up my teenage tomato plants, in that wild stage of growth when their gangly limbs aren’t strong enough to support their big ideas. Tie up and then weed. That was the plan. I did tie up the tomatoes. (I have concluded that my slavish following of the Florida Weave method did not work for me at all. I am already sketching other ideas in my garden journal.) Then I turned to the rest of the garden to weed. I started at the first row in the garden, and immediately reassessed. The cucumbers had triumphed over the aggressive shade of the squash leaves, and climbed up the trellis into the sunshine. The vines were now heavy with spiny little cukes. 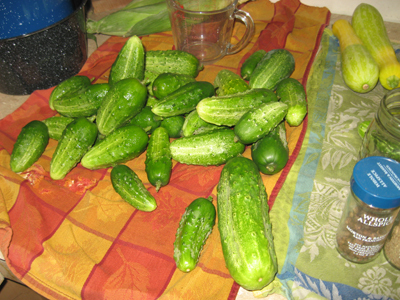 This variety (“Snow’s Pickling Cucumbers” from Johnny’s Selected Seeds) is meant to be harvested at 4-6″ (like my zucchinis and summer squash — 2011 is the Summer of Small at my house). Rethinking: No weeding. Pickling! There wasn’t a moment to lose. Not all of the cucumbers were of a uniform size, but I’ve never been a slave to fashion. Not all of the cucumber slices would be of similar diameter? That thought didn’t even rise to the level of a shrug. Much more important: did I have enough white vinegar and sugar? No and yes, and off to the store I went for a monstrous jug of white vinegar. 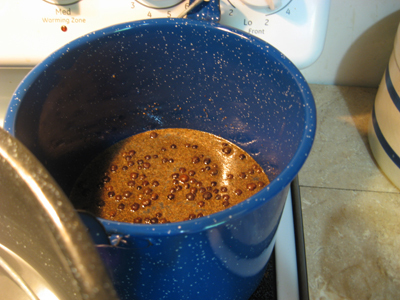 My unopened 5-lb bag of sugar would (just barely) meet the day’s challenge, as would my jars of whole allspice, mustard seed, and celery seed. 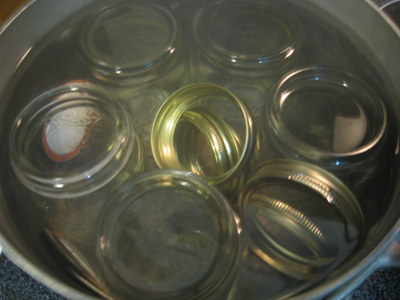 Canning reminds me a lot of cooking Mexican, Chinese or Indian food: the prep work is hugely time-consuming, especially in contrast to the amount of time actually cooking and eating. I love this book by Janet Greene, Ruth Hertzberg, and Beatrice Vaughan. Its looks call to mind a slow-moving urban river in summer, with the celery seed and allspice floating on the top, but the smell of spices and hot sugar syrup was lovely. On with the lid, tightly turn the collar, and into the hot water bath it goes for the prescribed 10 minutes. 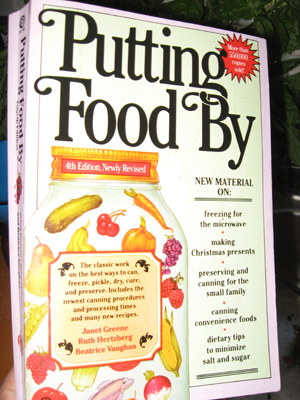 Eventually, all seven jars were placed on the cooling rack in the dining room, and I looked forward to the ‘ping’ that signaled that the contents were cooling and the vacuum seal was complete. But like so much of my life these days, what I expected and what I received did not match. This year, the jars did not ‘ping.’ Instead, as I began the kitchen clean-up, I heard a sturdy sound: ‘Tock.’ I heard it 7 times. That surprising sturdiness, instead of the more fey ‘ping,’ feels appropriate. After all of the “re-“‘s these past few years, from Recreation to Readjust to Refresh to Resolve, I’m a lot more ‘tock’ than ‘ping’ myself. Be glad yours sealed. I’ve read SO many blogs this year where folks are dealing with bad seals. A sign of the times it seems. How depressing to do all of that work, and have the seals fail! That would be a lot of pickles to consume at once! I was told that while you can re=use the metal bands (collars), you have to buy new lids each year, because the rubber around the edge of the lid fails after time. I’m so nervous about the food spoiling that I am ferocious about having the jars, food and water at a rolling boil all the time. I am inspired to try! I have never canned. Where should a rookie start? I just ordered the book. The pictures are so beautiful.